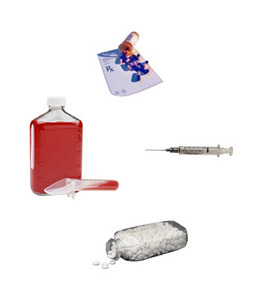 Transdermal medication delivery systems can be executed through a variety of methods including gels, creams, suppositories and buccal troches. Water and alcohol based gels, which can easily penetrate the skin surface, can be administered in unit dosages and can even be covered with a adhesive patch if desired. Creams and ointments provide many paths for suspended medications. Having pain management compounded in the form of a cream or ointment can provide direct relief for a patient without many of the unwanted side effects of an oral dosage. Lozenges and lollipops help with pediatric dosages. They can be placed between tongue and cheek where it then can deliver the active medical ingredient with a pleasant taste. The lozenge (cough drop) is directly absorbed through the oral mucosa, or side wall of the cheek. Suppositories, or otherwise known as the comical nick name "rectal rockets", are actually popular dosage forms for patients who need to treat internal and external conditions. Many times multiple medications can be compounded into one dosage to decrease the number of medications needed. Encapsulation medication through fill capsules provide traditional delivery, however, color coded pill capsules may aid the patient with multiple, "look-alike" medications. Montana Compounding Pharmacy can also provide sugar-free medication for diabetic patients, dye-free for allergic patients, and alcohol and preservative free medications for sensitive patients.